This was a tough cook. I told She Who Must Be Obeyed I’d make whatever she wanted. She said we had a small piece of halibut and a few chicken wing drumettes. She wanted both for supper. I asked if she meant wing appetizers and halibut for dinner. Nope, she wanted them together, sort of a cluck and surf I guess. The challenge didn’t end there. I was advised the wings were to be plain. There would be no hot sauce or spicy rubs. Just plain wings. Sigh, she must be obeyed, I always do what I am told and the cheque is in the mail. This post is how I did the “plain” wings and the next post will be the halibut. She Who Must Be Obeyed wasn’t in the kitchen so I quickly mixed together a few spices. This was difficult. I wanted to add some flavour but not enough to get me in trouble. 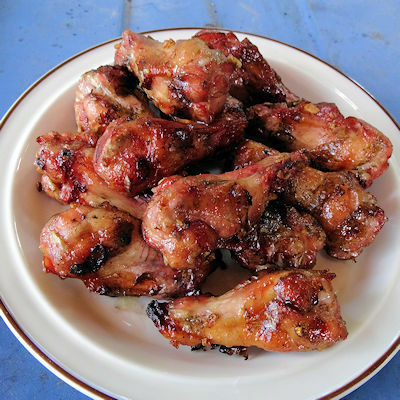 For the twelve chicken drummettes we had, I mixed 5 ml (1 teaspoon) of salt, 5 ml (1 teaspoon) of brown sugar, 5 ml (1 teaspoon) finely chopped garlic and 2 ml (1/2 teaspoon) pepper on a plate. I tossed the chicken wings in 10 ml (2 teaspoons) vegetable oil and then put them on the plate and turned them until all the rub had stuck to the wings. I had my Louisiana Grills pellet smoker preheated to 350 F and put the wings on. I cooked them for 40 minutes, turning once. I made sure the internal temperature of the thickest part of the drummette was over 165 F (it will be, we like them crisp). 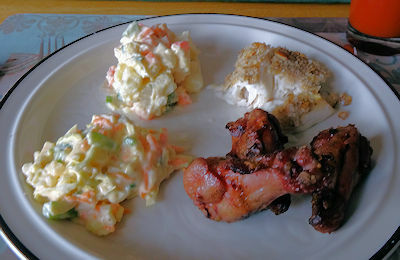 This was served with halibut (it was her idea, not mine), coleslaw and potato salad. These wings were nice and crisp. The minimal amount of seasoning meant you mostly tasted the chicken which isn’t a bad thing. Of course, they would be better spicy, just saying. However, the garlic gave it nice complex undertones, the touch of sweet/spice from the pepper and brown sugar just gave it a nice flavour. She Who Must Be Obeyed said these were perfect and that I didn’t have to season everything. Of course she is right. Please don’t tell her they were seasoned. Mix the salt, brown sugar, garlic and black pepper together on a plate. Toss the wings with the oil to coat. Put the wings on the plate and roll them around until all the spices have clung to them. Smoke or bake at 350 F for 30 minutes, turning once. Make sure the internal temperature is at least 165 F.
Let sit for a couple of minutes and serve. Ha! That is an interesting combination, but she must be obeyed! The wings look great. We haven’t done wings in a while and I know they would be popular with the hubby. I need to make some soon! No wings for the hubby for a while? Tsk! I love this method for makings wings. Also love the term “cluck and surf,” but were they good together? Thanks, Jeff. They were OK. I wouldn’t do it again unless the missus asks. The individual dishes were good. They were just a little odd together.